If I were having you over for lunch today I'd make you one of these sandwiches. 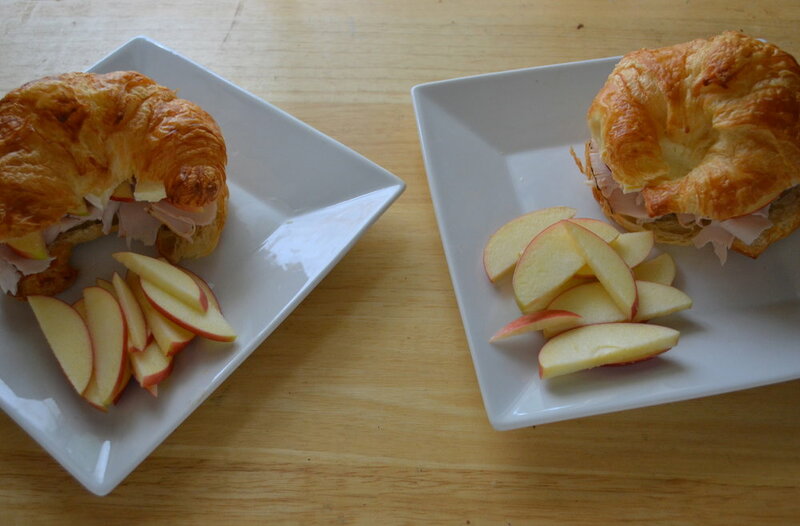 A quick yet indulgent apple, turkey & brie croissant. There would be miss-matched cups of warm tea and probably some slivers of dark chocolate for dessert. I'd tell you all about the projects I'm excited to start and those that I'm getting ready to dig deeper in. I'd want to hear how your transition from Summer to Fall is going and what's new in your life. At some point in the conversation I'd probably invite you to the pumpkin carving party I've been brainstorming. Fall is officially here this weekend, and for I think the first time in my life I'm OK with it. I'm ready for the warm layers, more excuses to snuggle and hopefully more lunch dates with friends. That last one's not really a Fall-specific activity, but I'm making it one of my resolutions for the coming months. Next smear a little mustard on the bottom of each croissant, then stack turkey, apple slices and brie on top. Place the other half of the croissants on top and serve with the remaining apple slices.